Atak ak zam Kont lokal televizyon Radio Kiskeya. Sa te pase byen bonè, 30 desanm 2015, o zalantou dis è 1am. biwo radyo ak televizyon Kiskeya yo te atake pa moun ak zam yo pa konnin. Zòn ki afekte enkli fasad bilding lan, pòtay ak pòt devan an. Pa gen moun ki te frape pa bal yo. Armed attack against the location of Radio Télé Kiskeya. 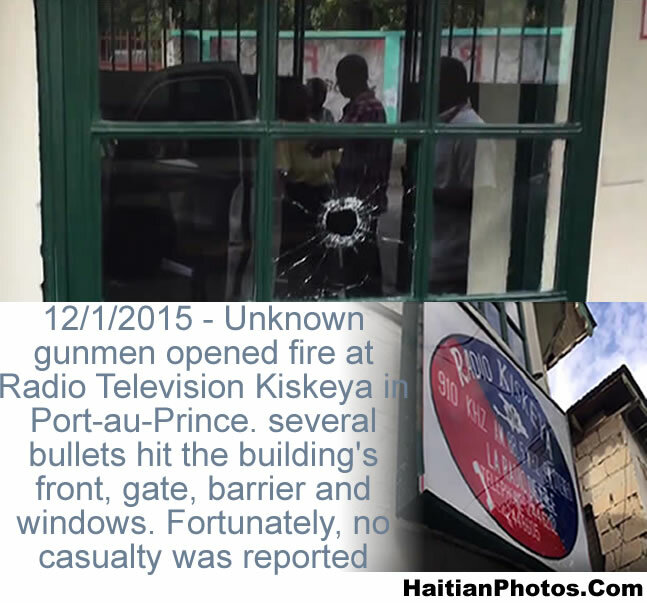 This took place early December 30, 2015, around 1am when the offices of Radio and Télé Kiskeya were attacked by unidentified individuals with guns. The areas affected included main façade of the building, the gate and the front door. No one was hit by the bullets. Jamaican officials reported that a major Jamaican suspect in a guns-for-drugs smuggling network between Haiti and Jamaica has been was killed last Friday in a confrontation with Haitian Police. The actual name of the suspect is unknown; he only goes by the alias name of "Mention". The beautiful Haitian island of Ile-a-Vache is not only reputable for its beauty and touristic opportunities. It appears that the island is also known for its guns-for-drugs trade, also called guns-for-ganja trade. Ile-a-Vache has been identified by Jamaican police as a key location for guns-for-drugs trade operates between Jamaica and Haiti also known as guns-for-ganja trade. I guess that young children do not resolve conflicts the way they use to. I just remember when I was a young boy, I would fight with my sibling and my friends with my bear hands. Some time I would be the victime; but a lot of time, ending up with bloody noze, etc. and in e few days, we will be friends all over again. I woud never once think about usig knive or even worst a gun to destroy the other person's life. I think kids now are more pragmatic. If there is a problem, why not solve it for ever? The same way they spend lots of time killing the opponents in video games they play frequently. 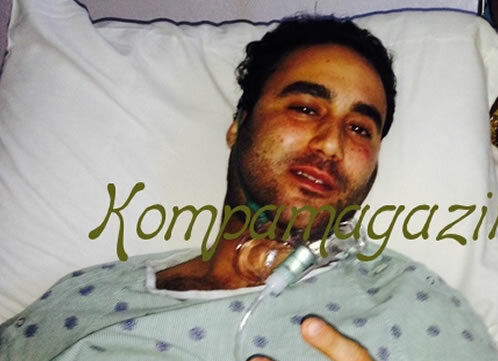 We received information that artist O-Gun of the popular music band Team Lobey was shot in the face. The incident took place as he was leaving his studio on Wednesday, January 29, 2014 in Port-au-Prince. 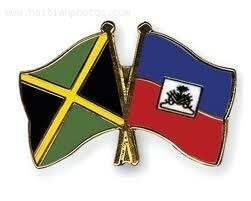 Team Lobey, a major player in Haitian Kanaval for the past several years may have to take it easy this year. There has been serious accusations brought to two very important, powerful and close friends and associates of President Michel Martelly. Sherlson Sanon, a child soldier an admitted former criminal, made damning testimony on the role of Senator Edo Zenny and former Senator Joseph Lambert, in a network of murder, kidnaping and drug trafficking with members of the gang "Base Kakos"
Comfortable living space, safety, security and luxury are some of the things that are uncommon among people living in Cite Soleil, an extremely poor town in the Arrondissement of Port-au-Prince in Ouest Department. 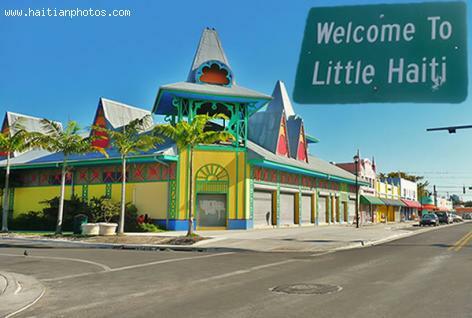 As a matter of fact, it is considered one of the poorest and most dangerous towns in Haiti. Around 400,000 residents live in Cite Soleil without a decent access to electricity. The sewerage and canal systems in the town are in poor condition, while only a few businesses are open to serve the residents. There are some hospitals and only one school. While half of the houses in Cite Soleil were made of cement and metal roof, the other 50% were makeshift shelters built in materials that residents have scavenged. Vladimir Jean-Baptiste is a 40 year old legal resident of Haiti who is a close friend to the President of Haiti. He took advantage of his closeness to the President by doing illegal business of bringing guns in Haiti from U.S. He was arrested and taken to West federal court for smuggling over two dozen semi-automatic handguns and shorts guns in the boxes of food. When he was interrogated he owned up to the accusations and admitted to have been involved with illegal business. Vladimir Jean-Baptiste admitted to have collaborated with Haitian officials who gave him a Blackberry phone. The Haitian government respected and feared him because of his closeness to the president. He took advantage of their fear used government officials in his illegal business. Bringing guns to Haiti meant endangering the security of Haitians. Therefore it was taken as a serious offense that led to five years imprisonment. If parents, teachers, and the community recognize the signs of an anti-social personality disorder appearing in a youth, they can take steps to get help for the individual. Here are twelve common signs to watch out for. 1. They exhibit cruel treatment towards people and pets. Repeatedly harm, threaten, and physically abuse them. 2. They frequently provoke physical altercations. 3. They use harmful or deadly weapons, for example, a baseball bat, rock, razor, knife or firearm.